As the temperature dips, the leaves change colours and drop, the snow flies, and we pull our sweaters out of storage, it’s officially the crossover of seasons from fall to winter. With the coziest season, we tend to reach for our our favourite treats. For some it’s Starbucks’ infamous PSL, and for others it’s large pots of creamy mac and cheese. At KEEN, we’re avid foodies, no matter the season (yes, we even have a cookbook)! We asked the KEENers about their favourite fall and winter treats, and where to get them. Check out what everyone said below! Pumpkin Pie. Anything else is the wrong answer. Just a regular Chai tea latte and warm baked goodies like cinnamon buns from Starbucks, Cobs, and Grandma’s house. I love a good pumpkin bread or pumpkin scone, but I also have a weakness for spiced things like a ginger molasses cookie to chai-spiced things. I prefer to bake or make my own treats from scratch! The Oh She Glows recipe for pumpkin spice syrup is pretty amazing. For my favourite winter treat, I love fruitcake (even if it gets a bad rep)–marzipan and all. It’s super sweet so if I’m going to eat some, it has to be my Grandma’s! I’m gonna be basic and say a good ol’ pumpkin spice latte. I like Starbucks for the classic PSL. Also, apple cider! For some reason, I always revert to mulled cranberry cider. Also, Spicebox Pumpkin Spiced Whiskey from Liquor Depot. haha. As you can see, we love our pumpkin pie, anything pumpkin spice and sweet treats. 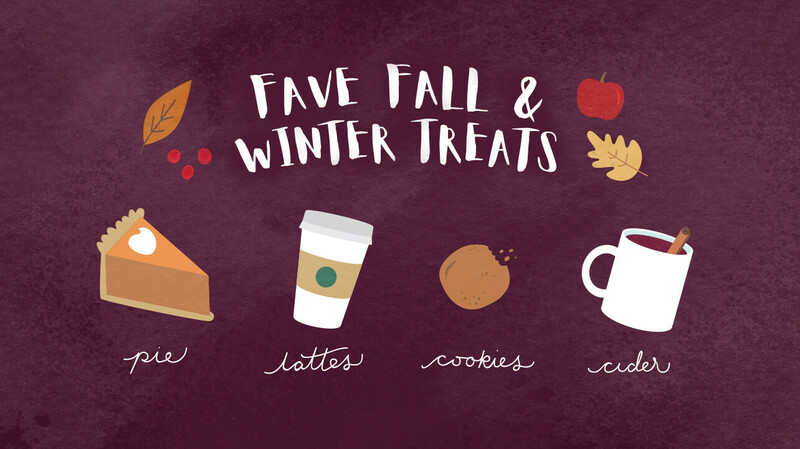 What are your favourite fall and winter treats, and where in Edmonton do you find them? Let us know in the comments below or on social!